According to data generated by the EPA, Americans are recycling more items now than at any time since the EPA began gathering waste generation data 30 years ago. The EPA’s 2013 report Advancing Sustainable Materials Management found Americans recycling and composting at a rate of 34.3 percent – about 4.40 pounds of waste per person per day. However, Americans are consuming more than ever – 46 percent more materials, per capita, in the year 2000 than in 1975. Materials such as rubber, leather, and textile goods can be found in landfills in the amount of approximately nine percent, however; these goods can find new purpose through contribution to resale clothing markets. One store chain has created a wildly successful sustainable business model upon the items destined for the dump and the man at the helm, Ken Alterman, president and CEO of the Savers family of resale clothing and thrift stores, is leading the way. Savers Thrift Stores are a familiar face of sustainable business practices in the U.S. and worldwide. Sixty years ago, entrepreneur William O. Ellison had an idea. A lifelong Salvation Army officer, Ellison financed the various thrift stores under his management and, by 1970, had opened six stores in three states under names such as “Value Village” and “Thrift Village”. The business model was simple, create contracts with non-profit thrift stores to provide an endless supply of unsold products, pay the non-profits and create an income stream for the stores. Ellison’s idea is a prime example of sustainable business practices that lives on in the form of the Savers family of stores, headed up by President and CEO Ken Alterman. Savers’ business model today is basically the same as Ellison’s – team with nonprofits, they solicit and collect useful household goods from the community, deliver to Savers’ stores, and collect money for each pound of goods delivered, sellable or not. According to Tony Shumpert, Vice President of Reuse and Recycling, only five percent of their backend clothing process is “true” waste, however; multiple changes occurred within the company in the areas of growth, volume, and minimizing impact of unsold items. Savers’ over 300 stores (including Value Village, Unique, Village des Valeurs, in Quebec, and Savers Australia) lead the post-consumer “waste” market from thrift stores. However, one issue remains – what to do with those items that nobody wants? As consumers are showing more concern about sustainability with each passing year, one area in need of increased environmental awareness is in the reuse and recycling of textiles and home accessories. 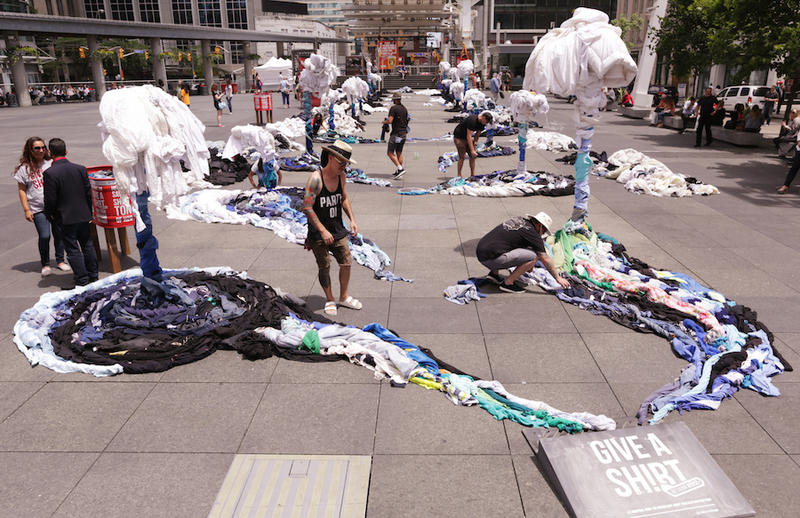 Reuse unwanted T-shirts instead of trashing them. Donate to local thrift shops (some offer home pick-up while others have attended donation stations). Learn more by reading this article on Apartment Therapy or check out The SMART Association website. One person can make a tremendous impact on the environment, especially when they have the knowledge of what it takes to create clothing. (Did you know it takes 700 gallons of water to make a single t-shirt?). Reuse, or thrift, stores, make a significant impact all the way up the supply chain by reducing the amount of resources needed to make an item to begin with. They also create jobs, reduce consumer costs, and even reduce pollution. If you have old, faded jeans with holes in them, you might find them distasteful and useless. But did you ever think what that pair of jeans might mean to someone in the Sudan? Savers wants to create a large “funnel” of consumer convenience to help convey the concepts of reuse and understand that most of their unwanted items can be recycled instead of adding them to the waste stream. “Unwanted items can be useful in their original forms in worldwide markets where used clothing is a robust component of everyday life”, according to Shumpert. Behavioral change and sustainability happens when educational opportunities are available and created with positive messaging. One person can make a huge difference (look at William O. Ellison, founder of Savers) and sometimes the smallest idea can make the biggest impact.